Neil had the advantage of knowing from an early age that music was to be his career. He formed his first rock band at the age of 10! 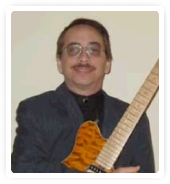 From there he progressed to being a member of school performing ensembles while receiving his Bachelor and Masters degrees in music composition and jazz education, all the while continuing to work as a guitarist, bassist, drummer, and vocalist with some of the area's best society and party bands. He has been a member of the South Florida Musicians Association (Local 655) since the age of 17. After college Neil worked for a few years as instructor of jazz at Miami Dade Community College before being hired by one of the area's largest full service event production companies as their in-house bandleader and music coordinator. His long tenure with that company afforded him the opportunity to learn virtually all facets of the corporate and social entertainment business, and to see it from the perspective not only of a performing musician, but also from that of those who actually produce the events. New Attitude Productions was formed in the mid-90's as a collaborative effort between Neil and his long time friend and musical colleague, Bruce Sharp. Their goal was to pool their vast experience and offer a fresh and new option for interactive and variety LIVE musical entertainment. Neil and the bands are still going strong in the South Florida area. From playing in a garage band as a teenager to fronting and managing one of South Florida's top entertaining bands, Neil's vast musical knowledge and experience gives him the expertise to produce virtually any kind of music for any type of event. So what are you waiting for? Doesn't your next event deserve a New Attitude?